With a view to generating awareness about RTI Act,2005 and creating transparency and accountability in the administrative system, Mahatma Gandhi State Institute of Public Administration Punjab(MGSIPA) organized a two-day training programme for Public Information Officers (PIOs) and Assistant Public Information Officers (APIOs) of Kharar Sub-division heretoday.About 25 officers/officials of different ranks of different departments are taking part in this programme. This Training Programme has been sponsored by Department of Personnel and Training (DoPT) Govt. of India to update the knowledge and skills of concerned officers about this legislation.Ms. 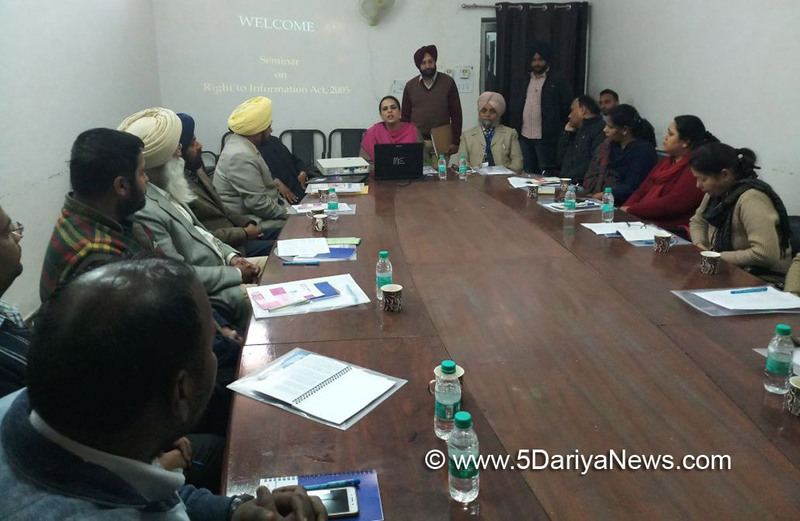 Amaninder Kaur Brar, SDM Kharar while launching the programme, said that the RTI Act is atool for good governance and a progressive, legislative measure for empowering the people and to give them the right to access information from public authority. It is a significantinstrument for achievinggoal of social justice and besides aiming to provide for setting out a viable regime of Right to Information for common man. She asked the participating officers to take full advantage of the 2-day training programme and equip themselves with the deep knowledge about this act from the experts who have a wide experience and knowledge.Jarnail Singh, Course Director (RTI) MGSIPA Chandigarh whilehighlighting the importance of RTI Act, 2005 training programmes, said that such programmes are being organized by the Institute at the State Level, district Level and Sub-divisional Level to sensitize the officers about the provisions of this National Act. He said that MGSIPA organizes over 250 programmes in a year on various other subject like RTI, Sevottom, Office Procedure, Civil Service Rules, Financial Management, Soft Skills &etc. besides proving consultancy, publications and dissemination of ideas/information in an integrated manner. A pool of resource persons, expert, of eminence in various disciplines are associated with training programmes.In the technical session, Mr. Bankey Bihari, Advocate, presented salient features,over all view of the Act and background of of Enactment of RTI. Sh. Yashpaul Manvi, Assistant Director (Retd. ), Punjab School Education Dept, gave detailed presentation on "Appointment of PIO's, APIO's, First Appellate Authority by Public Authority, Request for obtaining information, disposal of request, Exemptions from Disclosures etc., Third Party Information" etc. and Constitution of State Information Commission, Terms & Conditions of Service, Removal of Information Commissioners".Sh. Amarjeet Singh Sodhi, Project Coordinator, MGSIPA, Regional Centre, Patiala gave introduction of the training programme and concluded discussion among the participants in the afternoon.On the second day Dr. Puja Jaswal, Assistant Professor of Law, Army Institute of Law, SAS Nagar, and Sh. DC Gupta, IDAS (Retd. ), will deliver their lectures/presentations in the training programmes.